Looking for this, hunters? (If you're wondering what's going on, visit HERE.) I have today's trivia questions from Fiction Fervor's 2012 YA Story Scavenger Hunt here for you. 2012YASSH challenges you with your knowledge of young adult books published this year, and if you enter, you might win a prize! Check out it here for more info. And be sure to read the rules! 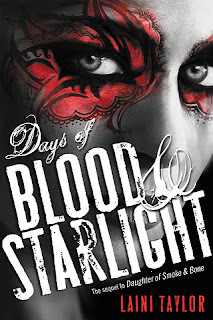 Without further ado, today's questions come from Days of Blood & Starlight by Laini Taylor. Easy: Who decides to spare Akiva’s life when she heaves a poleax? Medium: Of what is Ellai the goddess? Hard: What is Zuzana’s email address? Good luck with the remainder of the hunt! I really liked Kristin Cashore's Bitter Blue & Robin Lafevers' Grave Mercy. Gaaah, this is hard. I think the book that I fell head over heels in love with was Shadow and Bone. But there were so many great books. Sooo many! I have read TONS of books that have ended up as favorites this year. One of them was Silence by Michelle Sagara. I loved it so much. It is beautiful! So hard to choose but probably Rebel Heart by Moira Young!